My favorite travel moments are the ones that happen spontaneously while wandering markets that aren’t highlighted on the tourist map, or setting out for a day with a bottle of wine and intentions to get lost. But I have a secret: I love making plans. Creating travel itineraries is one of my hobbies. Yes, seriously. And Ben is a recovering Type A personality. He gets excited about Excel spreadsheets and is having a secret love affair with Google Calendars. When we set off on a 3-month backpacking trip in South America in 2014, we had so many plans that it was difficult to venture to places we heard about along the way. So this time on our travels, we decided to do things a bit differently. Go in with no plan whatsoever. Now that you know we are both avid planners, you can imagine that this was a challenge for both of us. And to be honest, it’s been a struggle. We had travel companions for the first two weeks. Since Ben’s sister and her boyfriend had only a short time in Thailand, we mapped out where to stay and what to do in those 15 days. When their final day came, we said farewell to them and our travel plans. When I say we had “no plans”, I mean it. No place to stay that night. Nothing. Should we stay in the islands or head north? Should we fly or take a night bus? We had a lot of big decisions to make, and we had to make them quickly. So we sat down with a couple drinks (apparently we think best that way) and spent that entire morning and afternoon planning our next few days. We went into this journey hoping that not having a plan would allow us to live more in the moment and enjoy our days without thinking too far into the future. But in fact the opposite was happening. It made us both realize that while we don’t need (or want) an itinerary detailing each day, we like having a rough idea of our next steps so we’re not caught off guard trying to make huge travel decisions at the last minute. We have learned a lot about travel and about ourselves along this journey, even though we’ve only been away two months. 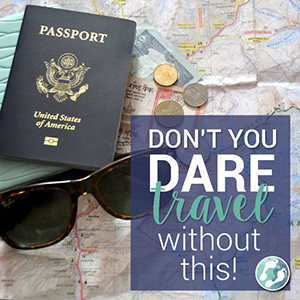 Having no plan has certainly brought some “excitement” to this journey, but we’ve learned that “excitement” in the form of being without a bed or unable to participate in something we’ve been dreaming about isn’t worth the freedom of not having a schedule. This has led us to realize that we like to have a balance between freedom and structure. We want to be able to be open to last minute plans, but we don’t to spend our days mapping out where we’re staying that night. We’ve learned that when we are going to a new city, we prefer to have accommodation booked. That way, we know exactly where we’re going as soon as we arrive. There’s no need to wander the streets in 90 percent humidity with packs on our backs. Once we get to a city though, it’s nice to have the freedom to extend our stay or move elsewhere. We’ve also learned that no matter how long we have in a place – whether it’s one week or 6 months – we will never be able to see everything. We have learned to prioritize and stop feeling guilty for missing out. We’ve learned that everybody has their own idea of spontaneity. For some, being impulsive means to try a restaurant without checking reviews first. Others are impulsive by nature and will wake up one morning, rent a motorbike and drive it through unmapped roads, camping along the way. We are somewhere in between, and are pushing ourselves to be open to experiences like the latter. And most of all, we’ve realized that there’s no right or wrong way to plan a trip. Just like every aspect of travel, it’s best to collect tips from others, try and fail, try and succeed, and see what works best for you. So what’s our plan now? Well, it’s rough, but it’s more than we had before we set off on this journey. We just crossed the border into Laos. After exploring this beautiful country, we'll head to Vietnam and Cambodia before making our way back to the south of Thailand to get our Scuba certifications. (And we have a couple surprises up our sleeves after that, so stay tuned!) How long we’ll be in each country only time (and visa regulations) will tell. But it feels better to have an idea – if only a faint one – of what’s coming next.